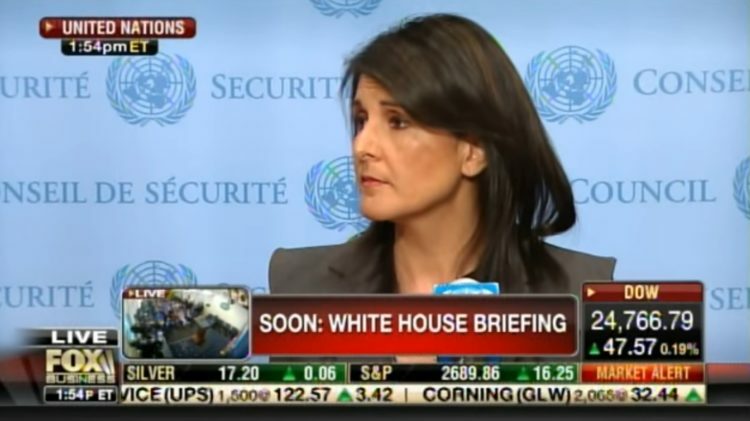 American Ambassador to the United Nations, Nikki Haley, is causing more heads to spin with a new Trump policy: No more money to the Palestinians unless you play nice with Israel. That’s the way it’s done. Speaking on the topic of the United Nations Relief and Works Agency, Haley made her statements outlining the new strategy. The UNRWA is dedicated to assisting Palestinian refugees until the United Nations considers them to have returned “to the negotiating table” with Israel. So, they only get their money if they are acting in good faith. And it looks like Trump is fed up with the millions of American tax dollars that are shipped overseas while the Palestinians refuse to cooperate. At this time, it is not clear if Haley means that funding will be withheld by the States from UNRWA specifically or from funding relating to the upkeep of the Palestinian Authority in general. The United States is UNRWA’s leading funder, providing more than $300 million per year. The Israeli paper, Haaretz, said that her statements will be interpreted as a threat against the Palestinians and an attempt to force them into peace talks. If that is what it takes, then so be it. The resolution Haley mentions is the recognition of Jerusalem as the capital of Israel. Trump has threatened previously to pull aid from countries that do not agree with the resolution. We are not only recognizing Jerusalem as the capital of Israel, we are moving our embassy there. Other countries are now following suit. The Palestinian Authority is about to hand in the documents required for signing on to 22 international conventions and treaties, 18 of which are under United Nations auspices, in protest against the unilateral American recognition of Jerusalem as Israel’s capital. This step, which is similar to decisions made in the past by Abbas, is intended to augment the recognition of a Palestinian entity as a signatory state to such treaties, similar to other states. In September, Haley again took Trump’s opinion to the United Nations by going after the Obama-era Iran Deal. Trump called it an embarrassment and Haley then spoke to the UN Security Council to say that Iran “stands out” for their “deliberate” contributions and support of terrorist groups in the area including Hamas, a Palestinian terrorist organization. They are a proxy for Iran. Just before Christmas, Haley sent a letter to other members of the United Nations saying that Trump “will be watching [the vote on the recognition of Jerusalem as the capital of Israel] and has requested I report back on those who voted against us.” She said that he took it personally and that we would remember who voted against us.